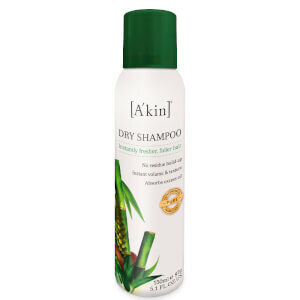 Instantly refresh hair between washes with the A'kin Dry Shampoo; a natural botanical formula that revives hair and banishes signs of grease without sticky residue or build-up. Fortified with Bamboo Powder and Rice Shampoo, the lightweight spray absorbs excess oil and eliminates impurities, whilst a blend of Millet Seed Oil and Argan Oil work to protect and nourish from root to tip. Ideal for post-workout, travelling and transforming hair before a night out, you can expect clean, revitalised hair with enhanced volume and texture. Shake well before use. Hold 30cm from hair and spray evenly, concentrating on the roots. Massage and brush through. Butane, Isobutane, Ethanol, Propane, Aluminium Starch Octenylsuccinate, Bambusa Arundinacea Stem Extract *, Oryza Sativa Powder*, Disteardimonium Hectorite, Panicum Miliaceum (Millet Seed) Extract *+, Argania Spinosa, Kernel Oil *+, Fragrance* (Eugenia Caryophyllus Oil, Citrus Limon Oil, Mentha Viridis Oil, Pelargonium Graveolens Oil, Cananga Odorata Oil, Citrus Aurantium Dulcis Oil, Juniperus Mexicana Oil, Citrus Reticulate Oil, Cinnamomun Camphora Oil), Limonene^, Linalool^, Citronellol^. + Certified Organic. * From Botanical Sources. ^ Natural Component Of Essential Oils.